Let's face it, good skincare requires a daily commitment. You can't just slap on an expensive cream once a month and expect to see magical wonders. In the midst of the Polar Vortex thing going on, here are some of my tried and true skincare rules and products that I swear by when my skin is feeling less-than-fabulous. Don't touch your face throughout the day. Your hands are filthy and pores don't like that. Wash your makeup brushes every two weeks. Bacteria thrives in those cozy moist bristles. My routine for cleaning brushes and sponges is outlined here and here. Double Cleanse. Remove your makeup first with an oil remover, then cleanse with Zapzyt's salicylic acid rich Acne Wash to remove impurities. Treat your entire face each day with manual and/or chemical exfoliation. Spot treatments don't always work, especially once breakouts have developed. Every day I use a muslin cloth to help remove all traces makeup, and 3x weekly I my clarisonic or Zapzyt's Pore Clearing Exfoliator to slough off dead skin cells. In addition, I'll use a leave-on acid like Pixi Beauty Glow Tonic to keep my skin radiant and flake-free. BEWARE: Irritation may appear long after your application of acid. Don't overdo it. Start small and remove any acidic products if your skin begins to itch. If anything burns, take it the f*** off. Fast. Irritants may include alcohol and fragrance. Ideally, you want to find a leave-on liquid or cream product that will both kill bacteria and moisturize on a daily basis. Recommendations below. Approach extraction with severe caution. Before squeezing any spots, ensure your skin is clean, then wrap tissues around your fingers. It keeps things sanitary. If you have little white heads, plucking the hair that comes out of the pore will often unclog the area overall. You can then apply products that will sink in better and deeper. MOISTURIZE - dry skin gets oily and clogs itself up. Don't forget to moisturize your eye area - Kiehl's Avocado Eye Cream and Avène's Soothing Eye Contour Cream are my favourite. Heal your spots with aforementioned moisturizer. Skin needs a healthy environment to repair, so when I have a scab left from a spot, I use Polysporin to help the skin heal without a leftover scar. Drink water and herbal tea, avoid coffee. The more water I drink, the less oily my skin gets. Coffee makes my skin worse and generally makes me feel like crap. Mask with charcoal 3x monthly to absorb oil. I love Clinique's charcoal masks, but have been branching into some new brands lately. I will use a warm towel or a Foreo Luna to gently remove the dry mask. Weirdly enough, I often develop less breakouts when I wear makeup - especially since my products are oil-absorbing. I also don't typically wear inexpensive face makeup, so I attribute the positive results to products that have skincare benefits to them: It Cosmetics CC Cream, Smashbox CC Cream, Koh Gen Do Aqua foundation, Laura Mercier Mineral Powder, etc. 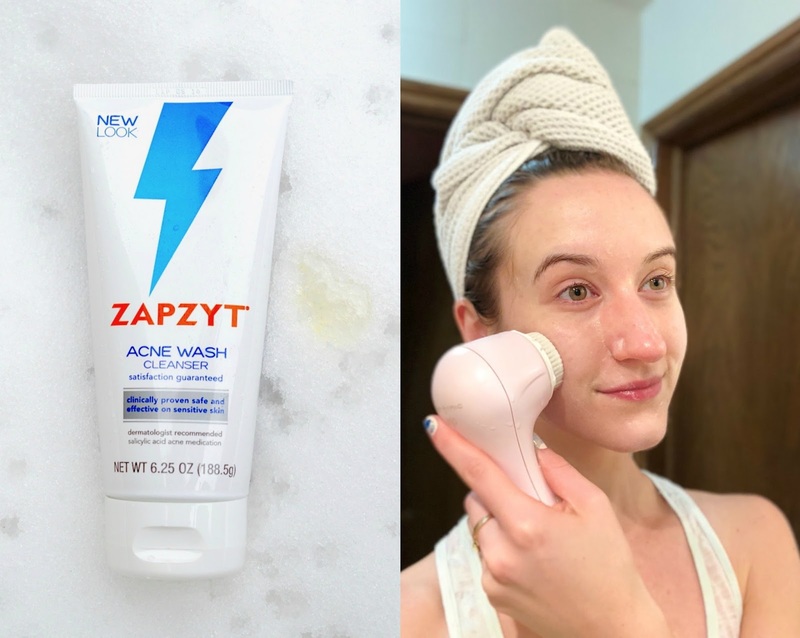 I really love this salicylic acid Acne Wash from Zapzyt. It works fantastically with my Clarisonic Mia to give my skin a very thorough, deep clean. Note: I would not recommend using this cleanser to remove makeup. It burns a lot when applied around the eye area. Zapzyt Acne Wash absolutely reduces my chances for developing breakouts and surprisingly does not leave my skin feeling dry or tight. I always follow up with moisturizer, and occasionally use this product to cleanse my chest and back too. Proper exfoliation for someone like me who gets dehydrated skin can be very challenging. You cannot get ferocious and over exfoliate, since this will cause damage. Thinning and irritated skin, a compromised lipid barrier, and micro scratches can ruin your skin's natural protection and invite bacteria into follicles. 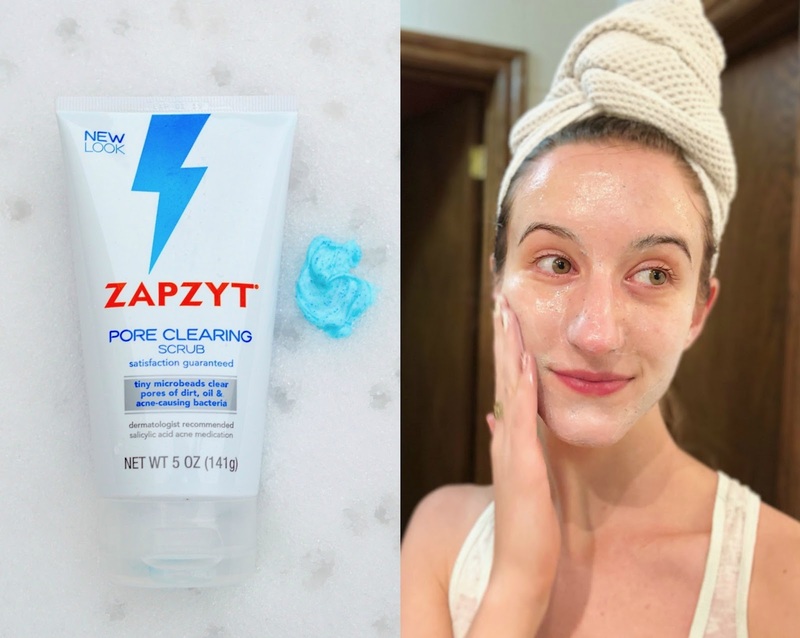 I adore the Zapzyt Pore Clearing Scrub because it feels so soft on the skin. The beads almost dissolve when you apply pressure, and they never feel scratchy. My skin always looks so fresh and renewed after using this exfoliator. When one of those monster spots starts to surface, I never know what to do. Benzoyl peroxide treatments are clinically proven to kill acne bacteria, and this Zapzyt spot treatment does not cause ugly flaking and peeling on my skin. It is properly balanced and sinks in without stinging or a sticky residue. You'll apply this spot treatment before moisturizer and/or makeup. Perioral dermatitis (appears around the nose and mouth/chin on women - irritated, flaky, red skin that can't be tamed: Hydrocortisone cream. Use a thin layer - 2 times daily for 5-7 days. Natural treatment for congested skin: Frankincense in Jojoba oil. Intense Hydration Treatment: Sheet Masks! K Beauty brands are best, look for Hyaluronic Acid. Post-Extraction Hydration and Pore-Reduction: Paula's Choice Resist BHA 9 Lotion. Nothing reduces redness and shrinks pores after extraction like this thin, powerful lotion. Buy it here. Natural, no-fuss Skincare Lines: Derma e. I've found so many awesome cleansers and moisturizers from them at reasonable prices. Drugstore Brand for Anti-Aging: Neutrogena (esp. retinol night cream) and Olay Regenesis. Sunless tanner for sensitive skin: Clarins Liquid Bronze Self Tanning - Reviewed here. Best Protective, Feel-Good Serum: Estée Lauder Advanced Night Repair and Ole Henriksen's Truth Serum. Healing a spot that's red, inflamed, irritated, pussing: Polysporin (numbing) and 100% Vitamin E Oil. Drying out a big pimple or one that's expelling liquid: Nexcare Acne Absorbing Covers or The Face Shop Pimple Patches. Oil Absorbing Masks: Anything Clinique and Aztec Secret Indian Healing Clay Deep Pore Cleansing Facial Mask. Reducing Redness, Plumping Skin, All-Over Rejuvenation: Avène Soothing Moisture Mask reviewed here. Natural oils for a quick fix: Rosehip seed, grape seed, more listed here. All-Over Moisturizer: Bioderma Hydrabio Crème for daily hydration and Bioderma Cicabio Crème for soothing and repairing damaged skin. Acid Treatment for Daily Chemical Exfoliation: Pixi Beauty Glow Tonic, AlumierMD Bright & Clear Solution or Paula's Choice 2% BHA Liquid. The whole Zapzyt collection can be found at Walmart.com. For Canadians, we can always check out Amazon.ca or venture across the border!